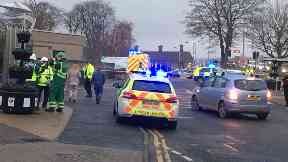 A vehicle struck the pedestrians next to Inverurie station, Aberdeenshire, at around 3pm on Friday. A pedestrian has been left fighting for life after three people were struck by a car in Aberdeenshire. Emergency services were called to the scene after a vehicle hit the pedestrians on Burn Lane next to Inverurie train station at around 3pm on Friday. One of those involved is in a critical condition while the other two are suffering minor injuries. Officers have closed off the road while they remain at the scene. A Police Scotland spokesperson added: "Emergency services remain on scene dealing with the matter and the road is likely to be closed for some time." A Scottish Ambulance Service spokesman said: "We received a call at 2.58pm to attend an incident on Burns Lane in Inverurie. "We dispatched three ambulances, our special operations team, a Paramedic Response Unit and a manager to the scene. "Three people have been transported to Aberdeen Royal Infirmary."